What Does It Mean When 5D Is Flashing on a Maytag Washing Machine? Many Whirlpool-made, Maytag washing machines come with a small LCD display to communicate messages from the internal computer to the user. In the event of an error, the display shows a two digit, alphanumeric code to help owners and technicians quickly identify the source of the problem. The "Sd" error code, sometimes mistaken for "5d" because of the limitations of the display, is relatively common and there are numerous solutions available. "Sd" appears when the washing machine detects an excessive amount of suds. "Sd" or sometimes "Sud" appears when there is an excessive amount of soap bubbles in the drum. 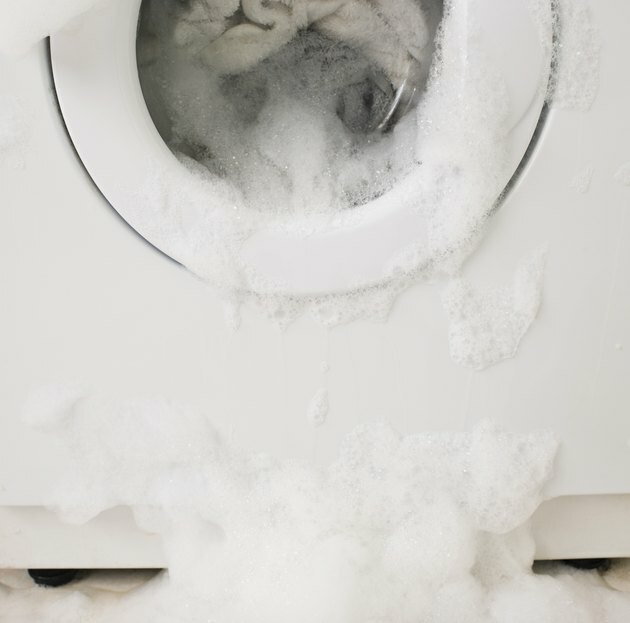 Suds prevent the washing machine properly spinning out water, which eventually leads to a stoppage in the cycle while the appliance adds more water to wash away the suds. The washer aborts the cycle, displays "Sd" and lights the "Cycle Complete" light if it is unable to clear the problem. Using the wrong type of detergent is a common cause of the "Sd" error code. Always use detergents labelled High Efficiency or HE in the amounts detailed on the back of the bottle for best results. Adding too much or using the wrong type of detergent confuses the washer's sensors and produces an error code. A blockage in the hose that channels water out of the washing may produce the "Sd" error code if the appliance is unable to remove water from the drum. Straighten out the hose as much as possible, making sure it empties into a utility sink or suitable drain pipe. If problems continue, disconnect the pipe and inspect it for blockages. Maytag acknowledges that error codes like "Sd" sometimes appear by mistake. Push the "Pause/Cancel" twice or "Power" button once to remove the code from the screen and try using the washer again. If the code returns, unplug the washer for 60 seconds and try the cycle again before calling for assistance.